I love this quote from Bossypants, a book written by Tina Fey. Truth be told, I’ve never read the book. Up until tonight, I actually thought it was a movie! But now after reading about it in Wikipedia, it’s going on my list of “must reads”. This quote, this one, speaks to my heart. I clipped it out of a magazine and have kept it in various places throughout the years. It’s been on my dresser, in my Franklin Covey day planner (yup, I still have one of those-what can I say, I’m visual) and even pinned to a clipboard where I can see it. But today, I trimmed it carefully and found the perfect picture frame for it. It will now sit by my computer as a constant reminder to not be afraid and to just go for it. It’s stayed with me, both literally and figuratively, because I have a very teeny character flaw in that I have a tendency to research everything to death. “Hi, my name is Lisa and I’m a perfectionist”. And while I’ve never been afraid of waterslides, I do remember as a young girl, my fear of jumping off the high diving board at the local pool. It’s the same thing…that intense fear of climbing to the top, looking down, and being scared shitless to go for it. That’s what starting this blog is for me…a very high dive. But back in those swimming pool days in small town Nebraska, I remember distinctly my foray into not only jumping, but actually DIVING, off the high diving board. It became fun, exhilarating and “old hat”. I imagine my blogging will someday feel like that. But in the meantime, I’ve been tepid, wary, and just plain scared of putting myself out there in the blogosphere. As my inner dialogue gets silenced, I get excited by the chance to share with others this gift I have of putting stuff together. I hope to inspire others with my love of thrifting, my sense of style, my decorating ideas and the ways I have found to motivate myself. In the past I’ve observed other bloggers, I’ve researched SEO optimization, I’ve taken WordPress classes, I’ve spoken to marketing experts, I’ve taken photos, and yes, I’ve written blog posts. But now, I’ve backed myself into a corner and I have no choice but to REALLY blog. Why, you ask? Well, maybe you’re not asking…but on the off chance you are, I’ll tell you. You see, I’ve had my interior redesign and home staging business for ten years. So there! Proof I’m not scared and I can get on that high dive and jump off! But I digress. I just had my logo and business card redesigned. I have new cards that outline my expansion into blogging, thrifting (that’s not new, I’ve just decided to elaborate on it) and wardrobe consulting. And here’s where the rubber meets the road…the titles listed beneath my name are consultant, speaker, and (gulp) blogger. So there it is, for everyone to see. My card says I am a blogger and now I must blog. I only have a few of my old cards left so I’ll have to hand these new ones out soon. I HAVE blogged in the past, but this time I am not messing around! I aspire to be really good, to be taken seriously (by who/whom, I don’t know, but someone), and to have fun. When I blogged before, it was more difficult for me. I researched (go figure) and agonized over what to write and exactly how to say things. This time around, I’m just going to let it all hang out and see what happens. I crack myself up on a regular basis, but there are times when I think and think and make myself a little crazy. I know there have to be others like me so I hope they will find me here and we can share a laugh or an agonizing moment together. So here’s the first blog in a series of many blogs. I’ll be sharing my musings on repurposing a life, a career, a home, and a wardrobe. For this Tina Fey quote, I rummaged through a storage basket of old frames. I admit I got distracted by photos in those frames (my family doesn’t call me Shiny Nickels for nothing) but managed to drag myself back to the task at hand…a cute frame. 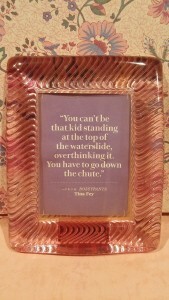 The quote is in the frame and it will sit here beside my computer and remind me that I can analyze, research, and ponder all there is to know about blogging, but unless I go down that chute, nothing is going to happen. So here goes!!!! Wheeeeeeeee…….